March 2017 | New Creation Inc. Feeling a little blue these days? Well, you aren’t the only one. As the Spring/Summer 2017 season is ramping up, we’ve been noticing certain shades of blue becoming more popular. Most interestingly, we are beginning to see entire outfits done in a variety of shades of the color. What was once, “black on black” is now “blue on blue”. While Indigo dye has been popular for awhile now, it is exciting to see those dark intense shades being paired with lighter, more desaturated blues. This creates a fun monochromatic feel but also gives an outfit some additional depth. In the Paul & Joe image (2nd from the right) the blue detailing continues to the belt and shoes, making the entire outfit come together but allowing each individual garment to stand alone. 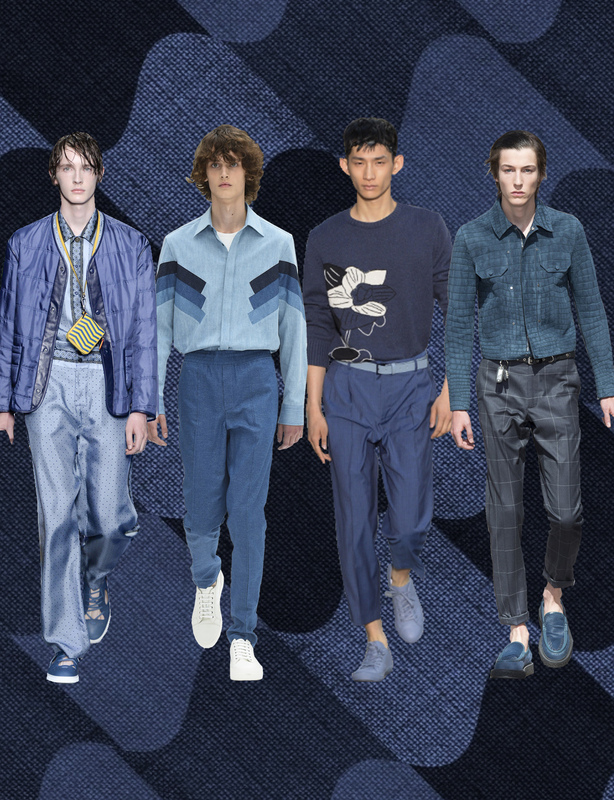 Our favorite, however, has to be the Neil Barrett top (2nd from the left) that takes “shades of blue” very literally. What reminds us a little bit of the process of choosing pantones, the three strips of chambray blue used on the front and sleeves creates a beautifully simple garment. Whether you are looking to create an entire collection, or are interested in taking a single garment to the next level, at New Creation we can help you reach your goals. We design and manufacture everything from womenswear to menswear & kids. We do knits, wovens, activewear, outerwear, and everything in between. Contact us today. We’d love to work with you. From the left: FENDI SS17 Menswear collection, Neil Barrett SS17 Menswear collection, Paul & Joe SS17 Menswear collection, Louis Vitton SS17 Menswear collection.